Our picks for the five best strawberry desserts that are available right now in the East Bay. Plus, Bissap Baobab celebrates its soft opening. 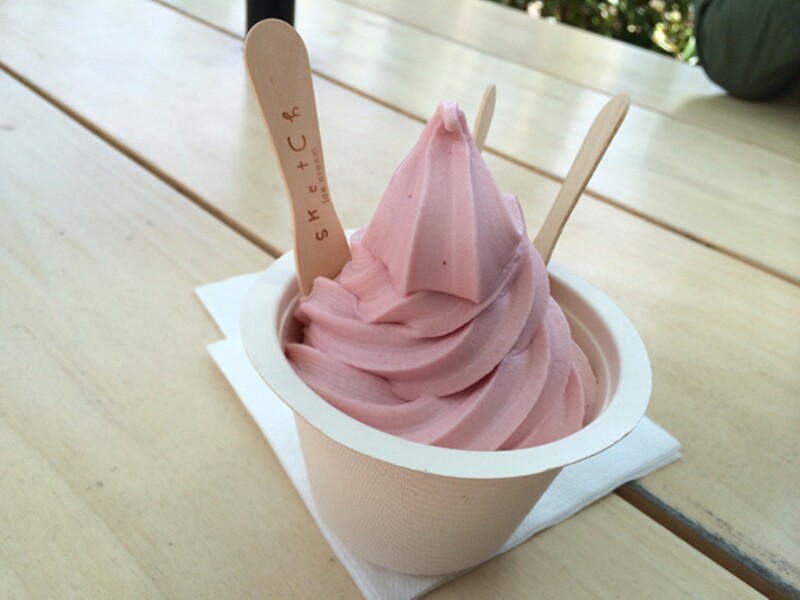 Sketch’s strawberry soft-serve ice cream. 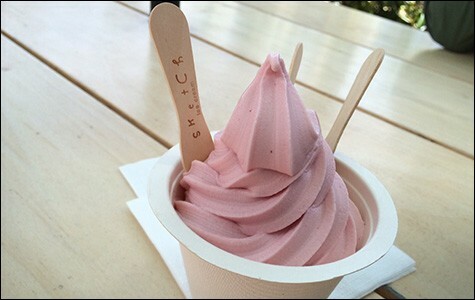 1) The soft-serve ice cream at Sketch Ice Cream (2080 Fourth St., Berkeley) is known for its pure, clean flavors, and the shop's seasonal strawberry soft-serve — made with roasted Swanton Berry Farm berries — is no exception. The flavor doesn't stray too far from what you'd find at an old-fashioned ice cream shop, but it's a little less sweet, with tiny flecks of pulp and seed that remind you that this was made from fresh ripe fruit. The best part is the ice cream's smooth, light texture. Call ahead, as the flavor is only available sporadically during the spring and summer months. 2) What I love about Berkeley's Asha Tea House (2086 University Ave.) is how there aren't any throwaway items on the menu, whether you're talking a pot of fine Taiwanese high mountain oolong or a simple cup of bubble tea. And when the weather's hot, there's nothing more refreshing than one of the shop's iced fruit teas. Unlike other bubble tea shops, where such drinks tend to be made with powdered mixes or sugar-laden, pre-packaged syrups, Asha uses real tea (brewed from loose leaves) and seasonal house-made fruit purées. Don't miss the highlight of the spring menu, the strawberry black tea, which features Asha's house blend of Assam black tea and, best of all, a purée of fresh California strawberries: little bits of pulpy goodness in every sip. 3) CupKates is one of the East Bay's longest-running gourmet food trucks — and the maker of some of the best-tasting cupcakes in the Bay Area. Proprietor Kate McEachern's particular genius is for creating superior cupcake versions of classic desserts that somehow don't feel gimmicky (case in point: her signature tiramisu cupcake). For the month of May, Cupkates' seasonal special will be a strawberry-rhubarb cupcake: vanilla-strawberry cake that's filled with strawberry-rhubarb compote and topped with a fresh whipped-cream frosting. A strawberry-shortcake cupcake — which subtracts the rhubarb but adds a vanilla cookie crust — will also be available periodically. 4) The strawberry cream cake at Crixa Cakes (2748 Adeline St., Berkeley) is a worthy splurge for fans of "Old World"-style desserts. Priced at $5.75 a slice (or $27 for a six-inch cake) and available most mornings until it sells out, it features two delicate kirsch-soaked vanilla chiffon cake layers that are wonderfully moist and fragrant, and just a little bit boozy. Sandwiched inside is a layer of fresh strawberries and vanilla custard (akin to a light cream-cheese frosting); on top there's whipped cream and crumbled amaretti cookies. This is the kind of sophisticated dessert that's equally suitable for a fancy birthday party or, if you're like me, a luxurious breakfast. 5) My out-of-left-field pick is Nation's Giant Hamburgers (1800 University Ave., Berkeley, and various other locations), which is kicking off an entire summer's worth of strawberry specials. Skip the generic fast-food menu of hot dogs and burgers and head straight for dessert: say, the individual-portion strawberry tart ($4.95). As far as pies go, this is no artisanal creation, and the pale, bland crust isn't much to remark upon. But if you're nostalgic for the kind of dessert you might have eaten years ago at an old-fashioned diner — a hillock of goopy, syrupy-sweet, Godzilla-sized strawberries (an entire pint's worth, at least) served with a big dollop of marshmallow-y whipped cream — Nation's will scratch that itch. The popular San Francisco-based Senegalese restaurant Bissap Baobab is opening a new location in downtown Oakland, at 381 15th Street, giving the East Bay a much-needed new option for West African cuisine. During its soft opening period, which will kick off on Sunday, the restaurant will only be open for lunch, from 11 a.m. to 3 p.m., Tuesday through Sunday. Proprietor Marco Senghor told What the Fork that to start out, he's focused on creating a number of "express" options — African wraps and savory crepes available as takeout options — to cater to the lunch crowd. Once the Oakland location's liquor license is approved, the restaurant will add its line of signature ginger, tamarind, and hibiscus juice-based cocktails, and expand its hours to include dinner. A soft opening celebration will take place on Sunday, May 4, from 11 a.m. to 5 p.m., and feature a free buffet and live music courtesy of guitarist (and Oakland native) Kenya Baker and a group of African drummers.